My kids love their new Mickey Mote so it is nice that Disney is adding new DVD titles that are compatible for use with the remote. If you are not yet familiar with the Mickey Mote then you are invited to read my previous review when it was released. 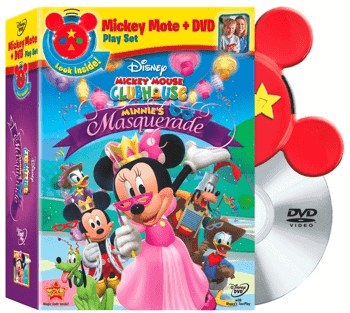 Mickey Mouse Clubhouse: Minnie’s Masquerade on DVD would be an excellent title to purchase if you have been considering purchasing a Mickey Mote. This DVD includes four Minnie Mouse themed episodes from the Mickey Mouse Clubhouse T.V. show. My daughter was thrilled that the new Disney title features Minnie Mouse as she and Daisy and all of the clubhouse gang have lots of fun playing dress up at Minnie’s Masquerade party. As always with the Mickey Mouse Clubhouse my children really enjoy interacting with the characters. My three year old son gets so excited when he answers the questions that a character has asked and I appreciate the entertaining yet educational spin. Minnie’s Masquerade is a lot of fun and my daughter enjoys dressing up to as part of the “show” in her princess dress and crown and the kids were dancing and singing to the theme songs too. Minnie’s Masquerade has two interactive playing levels when it is in the Discovery Mode™ thus providing multiple ways to watch and play. We tried it on both levels with level one being the most appropriate for my youngest son who is age three (recommended for ages 2-3) and level two being the best mode for my four and five year old children. Disney’s Mickey Mouse Clubhouse consistently provides fun programming for preschoolers and we continue to enjoy Minnie’s Masquerade on DVD with Mickey Mote! To learn more about Minnie’s Masquerade or to watch a highlight you are invited to visit the Disney website. It’s good that Disney still make movies outside of the main releases. They’re releasig the 3d Beautuy and the Beast soon in 3d! Good to know. I saw a coupon for it on DisneyRewards.com and was wondering if it was any good. Might have to get it as a birthday present in March!